Darren really knows what he is talking about when it comes to branding. This course was definitely worth flying over to London for. Head of Marketing. Global Pharmaceuticals Brand, Netherlands. Excellent content delivery, interactive group work and interesting participant mix made this a really worthwhile and enjoyable training course. Director of Branding and Events. Telecoms, France. Darren is a great trainer. Witty and very engaging. Importantly very knowledgeable and has sound understanding of Asian markets. Singapore Prison Services, Manager. Corporate Communications & Branding. Darren’s branding course was relevant and informative; above all, though, it was engaging — something that’s quite hard to do when you have a lot of information to take in and process. The three days spent working with Darren proved to be quite a paradigm shift. This has changed the way our business looks at not only our products, but more importantly our customers and the experiences our products enable us to deliver in the marketplace. Vice President. Digital Banking, Saudi Arabia. We deliver a number of Brand Experience Bootcamps based on our book, Building Brand Experiences. These range from our one-day Baseline Brand Experience Bootcamp through to our five-day Leadership Brand Experience Bootcamp. We also deliver in-house Bespoke Bootcamps based on specific client requirements in addition to Keynote talks at conferences and corporate events. Each Bootcamp is structured around one of our “Bootcamp Blueprints” which guide participants, step by step, through the Bootcamp’s content. Our Blueprints provide participants with an overarching framework that maps out the Bootcamp’s content. They also focus participants’ minds on delivering a final Bootcamp “take away” such as strategic and operational brand experience building plans. Each Bootcamp Blueprint applies “Practical Toolkits” from Building Brand Experiences. These are a suite of tried-and-tested techniques and templates we’ve developed over the years and use with our clients. Using these Toolkits keeps our Bootcamps helps participants’ put the ideas we introduce into action. Demonstrating the value our work delivers to clients is important to us. When our Bootcamps are run in-house we obtain key measures from participants before the Bootcamp starts. We then re-administer the same measures after the Bootcamp so you can see, in no uncertain terms, the positive impact our work has had on your team. Who should attend your Baseline Brand Experience Bootcamp? Obtain a hands-on understanding of how brand experiences can be built at their organisation. Our Baseline Bootcamp usually acts as a stepping-stone for our Intermediate or Advanced Bootcamps that are more focused on adopting a more integrated and holistic approach to building brand experiences. Where is your Baseline Brand Experience Bootcamp held? Our Baseline Brand Experience Bootcamp can be delivered at your premises or off-site. A number of clients have included this Bootcamp as part of a company conference or brand experience-focused team away day, where key members of the team attend the Bootcamp before, during or after the in-house sessions. How many participants can attend your Baseline Brand Experience Bootcamp? Between 16 and 20 participants is about right for our Baseline Brand Experience Bootcamp. This keeps things interactive, engaging, and to a large extent informal. Just the way we like things. Think about brand experiences in more practical and applied ways. Who should attend your Intermediate Brand Experience Bootcamp? Where is your Intermediate Brand Experience Bootcamp held? How many participants can attend your Intermediate Brand Experience Bootcamp? The Intermediate Bootcamp is suited to 16 to 20 participants. Any more than this means quantity starts to compromise quality. Start to adopt a holistic approach to measuring brand experiences that incorporates brand, employee and financial metrics into performance dashboards. Who should attend your Advanced Brand Experience Bootcamp? Participants who attend our Advanced Bootcamp have a good understanding of what brand experiences are and why they are important. Appreciate the rationale that underpins the brand experience building process so they can address common questions or concerns middle management or employees may have. Where is your Advanced Brand Experience Bootcamp held? Our Advanced Brand Experience Bootcamp is best delivered off-site. This means your colleagues can’t “borrow you” for a minute (which inevitably tends to be an exceptionally long minute) or ask you to “jump onto a quick conference call” (which is far from quick). 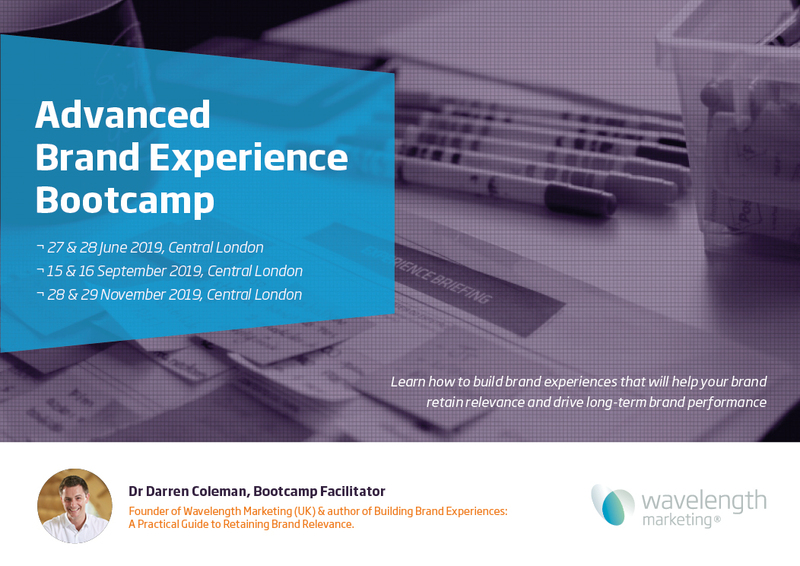 How many participants can attend your Advanced Brand Experience Bootcamp? The intensive nature of our Advanced Bootcamp means we advise between 12 and 16 participants. This helps us strike the balance between intensity and interactivity that Advanced Bootcamp participants expect. Who should attend your Leadership Brand Experience Bootcamp? Obtain advice on specific brand experience building issues with either of the Bootcamp facilitators. How many participants can attend your Leadership Brand Experience Bootcamp? The challenging, intensive and interactive nature of our Leadership Bootcamp means no more than 12 participants can attend. It’s not possible to facilitate the depth of discussion Leadership participants expect with larger groups. Where is your Leadership Brand Experience Bootcamp held? Our Leadership Brand Experience Bootcamp is best held off-site so participants can focus fully on the ideas that are being introduced. The Brand Experience Environment. The context your brand experiences are built within. The Brand Experience Essentials. The blocks your brand experiences are built on. The Brand Experience Enablers. The tools that bring your Brand Experience Essentials to life. Constructively challenge yourself (and your colleagues) to think about brand experiences in ways that disrupt the status quo at your organisation. Defining, Developing and Delivering Our Brand Experience: Executive Debrief. Clients frequently ask us to design bespoke Brand Experience Bootcamps that focus on a specific issue or context. In some instances, Bespoke Bootcamps are “recognised” or “endorsed” by professional trade bodies to give the Bootcamps more kudos, profile and recognition. Fine-tuning a Bootcamp so it focused on the client’s industry or the nature of their business. For instance, brand experiences for a B2B, services or place brand. Don’t worry about the detail of the content. Let us worry about that. We just need to know what you want the participants to be able to do after the training. We’ll then go away, have a think and share some suggestions for a Bespoke Bootcamp with you. The nature and scope of the Toolkit depends on the content. This is developed with the client. Who should attend your Keynote Talk? Acquire advanced brand experience building knowledge in a short period of time so they can lead brand experience building initiatives with greater confidence and conviction. Where is your Keynote Talk held? Our Brand Experience Keynote Talk can be delivered at public conferences, company conferences, away days, seminars or keynote events. How many people can attend your Keynote Talk? Between 50 and 200 people. Command more respect in the boardroom by adopting a more data-driven and scientific approach to building brand experiences. Due to the commercial value of the knowledge we share we’ll be unable to accept enquiries from ‘marketing agencies’. We’re not overly keen on working in the following sectors: Tobacco, gambling and defence.